Whether choosing liquid or granular fertilizer treatments, there are benefits and disadvantages to both. Application methods and timing are a few things to consider in addition to the cost of the product itself. Slow and fast release fertilizers are crucial to a lawn throughout the year, which is easily obtainable with a granular fertilizer. A granular fertilizer lays on the soil and once watered in, is broken down slowly over time. Unless the consumer is heavily over watering or there is a lot of rainfall, runoff is typically not a concern like a liquid fertilizer that can escape the soil or be diluted from watering. The application method also reflects on the cost of performing the treatment. A liquid treatment tends to be a “one-size fits all” type that cannot be adjusted easily. With granular, a technician is able to easily adjust the rate at which they are applying and the product being applied. This is something to seriously consider, especially if the company offers an organic and inorganic treatments. Switching from one to the other is quite simple when using granular fertilizers and allows only one trip to be made to an area rather than having an organic truck there one day and a nonorganic truck there the next. A liquid fertilization is usually applied with a long spray hose attached to the water tanks in or on the truck. When spraying any liquid, wind becomes a factor and can carry the liquid anywhere it wants. The granulars are heavier and tend to fall where they are intended to be. A granular treatment is also more time effective, as the technician is walking or riding in a pattern over the lawn to spread the product evenly. The more time effective, the more cost effective which has a beneficial impact for both the customer and the company. The time it takes for the technician to walk and drag a hose around the yard, house and landscaping can reduce the number of treatments completed each day or increase the hours a technician has to work, in turn reflecting that cost onto the customer. 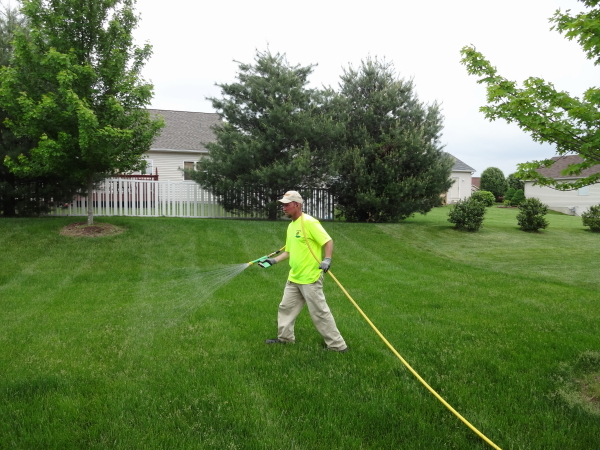 A typical lawn care program, using granular fertilizer, consists of a combination of slow and fast release nitrogen. To be able to offer both types, a company can visit the lawn less frequently, reducing cost for the company as well as extra treatment fees for the customer. A lawn on a granular fertilizer program needs to only receive 6 treatments throughout the year, typically every 6 to 8 weeks. When a liquid fertilizer is applied, that product is absorbed by the roots almost instantly and there isn’t too much of an option available for a slow release component. This requires more frequent visits for treatments, typically 6 to 8 treatments every 4-6 weeks. To sum it up, every company has their preference and reasoning behind their treatment choice the same way that every customer has their preference. Some prefer the instant spurt received from liquid, some prefer the time release of granular just as some prefer fertilizer more frequently and others (or most) prefer to save as much money as possible by reducing the amount of treatments being preformed.